Biodiversity has been a catch phrase of many environmental movements over the past several decades, with good reason. Put simply, biodiversity refers to the number of different species in a particular environment. As a rule, the more biodiversity the better, but this is an over-simplification. The tropics, are much more biodiverse than the poles, but few people would argue that the poles are less valuable. There are three different kinds of biodiversity. The first, and most obvious, is simply the number of species in any specific area. Unless we have baseline figures we simply don’t know if this number is going down, remaining static, or even going up. The second is genetic diversity. It is widely accepted that a reduction in genetic diversity is a bad thing. Small populations have small gene pools, and this leads to an inability to cope with novel evolutionary challenges. The vaquita (a small dolphin found in the northern Gulf of California) has a current population of around 30 individuals and will almost certainly become extinct in the near future. The third measure is ecosystem diversity and even on this measure we don’t do well. Terrestrially many wetlands have been drained, and some terrestrial ecosystems are in trouble through a combination of human caused factors. According to the IUCN the Aral Sea, a huge saline lake, is an unrecoverable ecosystem. Diversion of the river to irrigate cotton by the former Soviet Union led to much of the lake drying out. A dam and diversion of more freshwater into the northern portion has brought about some recovery but the outlook for the larger southern part is bleak. Sadly, humans have reduced biodiversity since we first evolved.With the advent of modern technology our capacity to eliminate species has increased exponentially – and so has the number of extinctions. Several pundits have argued that the chain saw was the most destructive tool ever invented and they may be correct. Much of the world’s original forests have been felled, initially for timber or farmland, more recently for oil palm plantations. The elephant in the room here, one rarely discussed, is over-population. There are too many people and as the standard of living in developing countries improves, the demand for natural resources increases in tandem. It is impossible to have infinite growth in a finite planet. 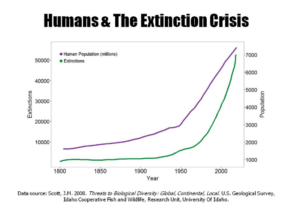 The graph below illustrates the link between human population and extinction rates nicely. But when we talk about extinction rates people tend to think of the “charismatic megafauna” – the big stuff like elephants, whales and polar bears. Lice just don’t get a mention. The same is equally true for plants. The big showy stuff grabs the attention. For hundreds of years we thought that the oceans were just too big to be affected by human activity. We now know better. Dead zones abound, there are huge gyres of plastic (the Great Pacific Garbage Patch for example). We almost hunted blue whales and right whales to extinction and did eliminate Stellar’s sea cow in only 27 years. Most fisheries are in rapid decline and some fisheries are functionally “extinct”, Newfoundland cod for example. Sometimes biodiversity increases because of human interference in ecosystems. San Francisco Bay has the highest number of introduced marine species on the planet, 85 at last count. Over half the fish species in the bay and a majority of the invertebrates are introduced. Most introductions are accidental, organisms arrive in the ballast water of ships or as fouling organisms on their hull. Occasionally someone may just release organisms from home aquaria. Introduced species frequently outcompete local species putting them at risk of extinction, so while biodiversity increases in the short term, the long-term consequences may be profound. The accidental arrival of the marine lamprey into the Great Lakes remains one of the most salutary examples of such impacts. Actual extinction rates are unknown, but the consensus is that humans have increased extinction rates by a factor of around 1,000. In a 2014 study the background extinction rate, was revised from 1 species per million to 0.1 species per million species per year which makes current extinction rates 1,000 times the background. Such studies obviously have high margins of error, and some of the assumptions may just be informed guesses. Whatever the true situation ANY increase over the background rate reduces biodiversity. So why does this matter? First there are the ethical and moral questions. Do humans have the “right” even by accident, to bring about the extinction of any species? An emerging consensus is that we do not have that right. As the old saw has it “We do not inherit the earth from our ancestors; we borrow it from our children”. Inside a few decades you may be explaining to your great grandchildren why there are no bluefin tuna or polar bears left in the wild. Secondly, we do not even begin to understand the implications or consequences of most extinctions. Many of the organisms that become extinct have probably never been scientifically described. Sometimes an extinction has obvious consequences – if we were to lose honey bees the economic impacts would be profound. If we lose a snail darter the consequences may not be immediately obvious. We can’t afford to take that risk. We must be proactive. We have to maintain as much biodiversity as we can or even enhance it. The classic example of this is the reintroduction of wolves into Yellowstone. The subsequent trophic cascade increased biodiversity and improved the health of the entire ecosystem. This was brilliantly presented by George Monbiot in a TED talk. Most attempts to restore biodiversity are not so dramatic, particularly in the ocean where it is more difficult to observe results. Marine Reserves (discussed elsewhere here) allow commercial species to increase in number and for ecosystems to return to their original state in many instances. Associated with biodiversity is the concept of a keystone species. The name comes from the keystone of an arch – the last block that keeps the arch from collapsing under its own weight. Several marine keystone species have been studied including the ocher sea star and the sea otter. Each directly impacts local biodiversity. Ocher sea stars are found in the intertidal zone on the West Coast of the United States. They are voracious predators of mussels and to a large extent determine the distribution of these bivalves. Studies have shown that rockpools with ocher sea stars present have higher diversity than those without. While at first sight this seems counterintuitive, it makes sense when you learn that mussels are capable of crowding out large areas of substrate thus making it unavailable to species that might otherwise live there. Add some sea stars, the mussel population goes down and real estate is made available to many other species so biodiversity goes up. Sea otters play a similar role in kelp beds. They control sea urchin populations. Without the otters the sea urchin population explodes, and they eat the kelp, ultimately leading to its loss and creating the poorly named “urchin barrens” (which are definitely not barren!). With the kelp gone the main basis of the food chain disappears and the biodiversity goes down. Ultimately our rivers and streams lead to the ocean. The cleaner we can make them, the lower their impact on all the ecosystems they pass through on the way. The less pollution that reaches the ocean, the less the impact on biodiversity. By reducing inland pollution of our waterways we help preserve biodiversity. How you can help is outlined in several other places on this website.